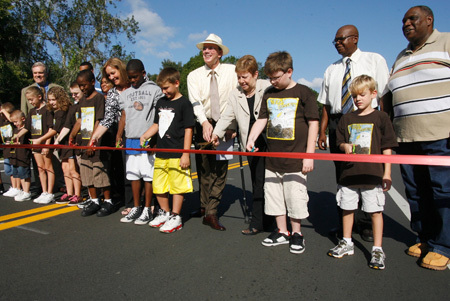 Members of the Hillsborough County Board of County Commissioners, joined by students from nearby Nelson and Pinecrest elementary schools, along with teachers and local residents, attended two consecutive ribbon cuttings for the recently completed Durant Rd. Bridge over Turkey Creek and C.R. 39 Bridge over the Alafia River this month. The county spent a combined $7 million in Community Investment Tax funds to completely replace the two outdated bridges, which, according to County Commissioner Al Higginbotham, were the result of the county’s billion dollar improvement plan.“Safety comes first,” Higginbotham said. “These two bridges—both close to a half-a-century-old—needed no excuse not to be replaced and will provide a much improved traffic flow as well as safety for the nearby schools and residents that use them.”The new Durant Rd. Bridge, built by Cone and Graham Construction, located between Schoolhouse and Joe Davis roads, west of Turkey Creek Rd., replaces the old one, which was built in 1966, now having 12-ft. wide lanes with 8-ft. shoulders and 5-ft. sidewalks on each side. At a cost of $2.2 million, the bridge took approximately 13 months to complete. Nelson Elementary School Principal Cyndi Guy, who brought 11 students to take part in the Durant Rd. Bridge dedication ceremony, was excited about the improvements on the heavily used bridge near her school.“We are glad to be able to bring out some of the students for this ceremony. It is good for the kids to connect with the community,” she said, adding, “Of course, the construction phase was rough, but I am happy with the improvements and the county’s cooperation and work.” Valrico resident Erica Hancock, who brought both of her children to the event, said, “The bridge is so much nicer now, especially since it doesn’t have that sharp curve it did before which slowed traffic due to the lack of visibility. I am very happy with the end result.” According to Hillsborough County Spokesman Steve Valdez, the county is now focusing on its next bridge project scheduled to begin in early 2010 in Riverview as part of the Boyette Phase III road widening project.Valdez said that the county is also looking at several other bridge projects down the road but none are scheduled at this time.For more information about other county construction projects, please visit www.hillsboroughcounty.gov.